Phil Kenyon could well be the greatest coach you don’t know, or haven’t heard much about. Some of that comes down to choice, hence you rarely see him on TV screens, but it doesn’t help that he’s a master in the field of putting, the one part of the game golfers struggle to get excited about. Only the serious players, he admits, come for a golf lesson. The rest of us suffer in silence. It’s an attitude Kenyon has battled to change ever since he started working as an apprentice for Harold Swash, the legendary ‘Putting Doctor’. “I was his cameraman and bag-man,” he says. Kenyon was a tour pro in those days, in need of some extra income. But as the money dried up on the course, he swapped the mini tours for university, where he completed a master’s degree in sports psychology. In his late 20s, Kenyon returned to coaching full-time as Swash’s assistant. As he worked his way up, he worked his way back to the tour, where he was introduced to Henrik Stenson by Pete Cowen in 2008. Within a matter of days, he had his first high-profile client. As other players took notice, Kenyon’s reputation grew and he became the go-to putting man for many of the world’s best. Justin Rose’s tendencies were typical of most club golfers. When I started working with him at the 2016 Open in Troon, he had a push pattern in his stroke and would aim left to compensate. That was difficult for him to manage, so we tried to match up how he controls the rotation of the putter head with his alignment and green reading. Really, I wanted to help him simplify things, because he would spend a lot of time drilling his technique. Since then, we’ve put into place some processes to randomise his sessions and stop him tinkering around as much. One of the big changes we made was changing the position of Justin’s right arm to help him release the putter head better. Just prior to the Ryder Cup at Hazeltine, we were exploring different techniques and testing a few different putters. We tested a claw grip and the numbers were unbelievably good. We were sat in his golf studio afterwards and the debate was whether to make the change there and then. I told him at the time that you’ve got to be prepared to putt really poorly, using that, at the Ryder Cup. If you’re not, it’s the wrong time to change. He chose not to, because it would have been a big change and hard to fully embrace in that environment. I think that was a good thing because he didn’t putt very well at the Ryder Cup, and as a consequence we had a ready-made Plan B waiting to go. Luckily, the change in grip has really helped to manage certain aspects of his stroke and feel. If you look at his strokes gained: putting stats, they are the best they’ve ever been. He had never been inside the top 100 (on the PGA Tour), and yet he finished 17th for the 2018 season. Putting is one area of the game where you can make a big improvement quickly. Irrespective of your handicap or status, everyone can putt well. I’m never going to drive it 320 yards, no matter how hard I work in the gym or on the range. I’m limited. Whereas in putting, that’s less of a problem. It’s not like you need a certain amount of physical talent to putt well. I teach guys who play low-level golf, but putt well. I don’t see many 20 or 10 handicappers drive it like DJ, but I see some putt it better than some tour pros. 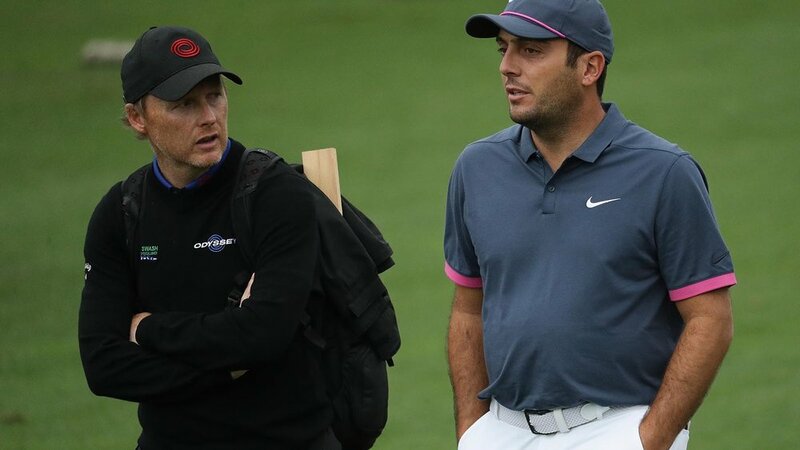 What works for Rose or Molinari might not work for you. Technology shows that everyone moves the putter head differently, and as a consequence I don’t believe you can prescribe a remedy or recommend one grip which will suit everyone. It’s more about matching the hand placement with the pattern of your stroke. It’s a bit like a puzzle, because it’s not only the placement and pressure of the hand which has a big impact on the wrist sequence, and the orientation of the clubface, but also your arm position and how your shoulder and elbow sits. It can be tough to manage on your own, which is why it’s important to go for a lesson and have someone go through that problem solving with you. Most amateur golfers don’t control their speed or swing length very well, and hit putts using the same backswing. Any variance in speed comes from acceleration. One of the biggest myths perpetuated in golf is that you need to accelerate into impact, when actually the best putters in the world tend to decelerate slightly. Think about it: You hit every putt with your backswing; you don’t hit a putt with your follow-through. There’s no such thing as a “textbook” set up. We’ve measured over 100 tour pros using 3D technology and not one person stood square to the target. The average tour player aligns seven degrees open, ranging up to 20 degrees open. My point is that their set up is geared towards helping their stroke function. If you cut across the ball and hit pulls, standing open won’t help. Working more towards square will neutralise that. Whereas, if you’re someone who hits pushes and swings in-to-out, standing open could help. Every golfer would benefit from having their stroke measured. TrackMan now has a putting measurement, and there’s also Quintic Ball Roll and SAM PuttLab, so there’s a lot of options available to you. At Formby Hall, we use a system – GBD – which measures the body as well as the putter in 3D. I think if you use technology wisely, it’s very good because you can understand better what you do and what needs improvement. Ultimately, though, it’s down to the skill of the coach to decipher that information and say what’s relevant to you. The type of putter you have is important, but I do think it is overstressed at times. Most peoples’ strokes are so inconsistent that a slight change in putter head doesn’t have much of an effect. Different head shapes and how they affect the rate of rotation may be more important for the better player, but more so it’s about the length, lie and loft. All three affect your set up, which then influences your technique. Before Frankie went to the States and won the Quicken Loans, we highlighted how his tendency is to get long and loaded in the backswing, and then decelerate too much. It’s the opposite of what the average golfer does, so we were working on improving his tempo. That really helped at The Open. He holed out really well on the back nine at Carnoustie. That week, we were just focusing on short putts but he was in good nick so there wasn’t anything overly specific. When Tour pros practise their putting, sessions are often split into three parts. The first is based around feedback, and using things like gate drills or mirrors. If a player is working on their set up, they might place a mirror on the ground or use a putting template to give them feedback on their stroke shape and what it needs to feel like. Once they’re feeling comfortable, the next step is on developing skills, and that can involve using certain exercises to test their green reading or ability to control their speed and match it to their start line. A great drill is to read a putt, get a feel for where you want to start the ball and place a gate down and roll the ball through it. If the ball doesn’t go in, it’s either a speed or a read issue. The final part is usually some kind of performance drill, where there’s no feedback or focus on technique. The challenge is to get the ball in the hole. The hurricane drill is a perfect example. To set it up, place six balls around the hole so the first putt is from three foot, the next is from four foot, the one after that is from five foot and so on. It should create a spiral around the hole so every putt is a different distance and angled across the slope, and requires you to control your speed relative to the read. Added to that is the pressure of needing to hole every putt. You can only move on once you’ve holed all six putts consecutively. You could be there for a while, but it focuses the mind, makes it more relevant and incorporates lots of skills.